A tribute to the Crane and her elegant representation of serenity and power. I had mine for over a couple years. Trained with it, cut lots of targets. Took care of it. Theres still no rust or corrosion and still as sharp as it came. 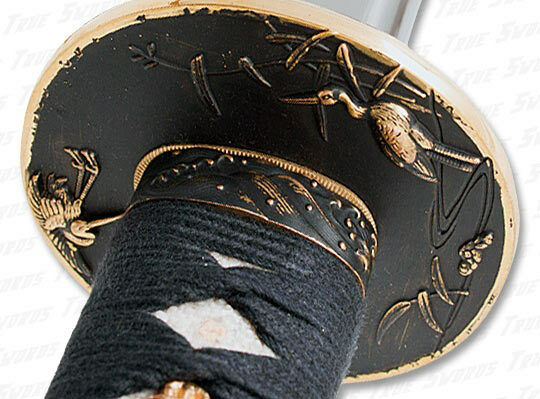 This sword is very beautiful but as yet deadly. This sword arrived fast, and in perfect condition. Upon opening it was wrapped in a plastic with a mineral oil to preserve the blade, and in a fine cardboard box that did it's job in protecting the blade. It sliced through dozens of water bottles, plastic cartons, and continues to do so. In the section of the blade where I had done the most cutting with started to dull, and would not completely cut through a solid water bottle now, but it still was sharp enough to draw blood from when I was cleaning it. Anywhere else on the blade and it cut through just fine. For the price, this was a great buy, just not the high durability I would have expected from 1060 steel, but it still remains battle ready. This is an excellent sword for the money. True clay temper, solid fittings, 1060 steel, razor sharp with a good balance, this sword is truly battle ready and highly functional. The fittings aren't perfect, with the paint being a bit sloppy, and the cloth wrap over the ray skin slows a tiny bit of wood here and there, but for $100, it makes a great cutting sword to learn on without breaking the bank. Excellent value. I received this sword 3 days after ordering. This sword is a god buy for the money and lives up to the promotional info. here at True Swords. Not quite razor sharp but a little edge polishing with a extra fine diamond hone fixed that. The only con would be that the guard is of an unspecified zink alloy and not solid brass as the other fittings. This was mentioned by T.S. and no surprise. 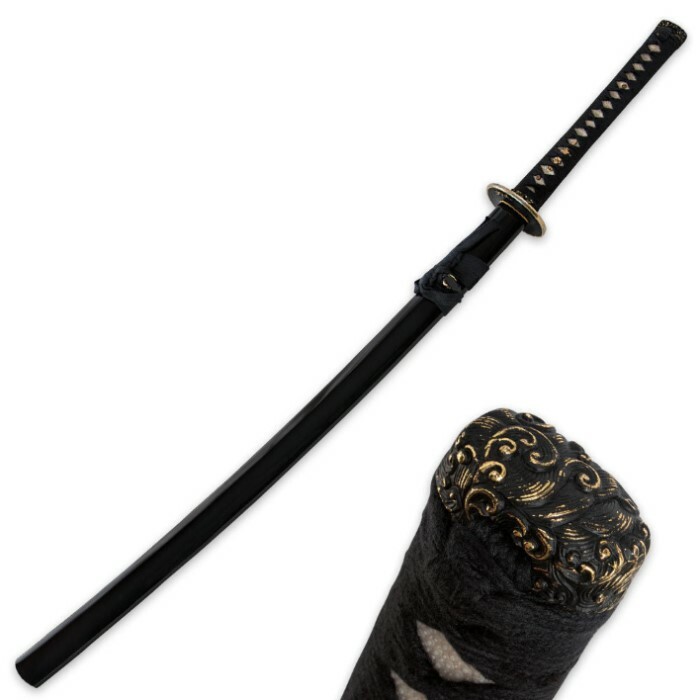 I have seen an almost identical sword but of 1045 carbon steel for $100.00 more. Test cuts were sweet, balance is perfect at 4in. from guard and every thing is nice and tight. Get one when they come back in stock, you will not regret it. This is not my first sword, but it is probably one of, if not, the highest quality ones in my collection. Do not order this sword with unrealistic unexpectations! For a SUB 100 dollar blade, it really does not get better than this. Absolutely lovely tsuba. Beautiful hamon. This is a great sword, I recommend it to collectors at any level. Always remember, please be safe when your blade is out of it's saya, and keep weapons inaccessible to children. I thought these could flex more, THEY CANNOT... Do not attempt to flex or bend this beyond 15 degree's, mine bent around 15-20 degrees. It bent right back, but that completely destroyed my view of this sword... On the up side, it came fairly sharp (not razor sharp), but it was able to cut through up to 1/2 inch bush stems (at the right angle)... The boxes and small branches were like butter. No dings were detected after trimming some hedges. 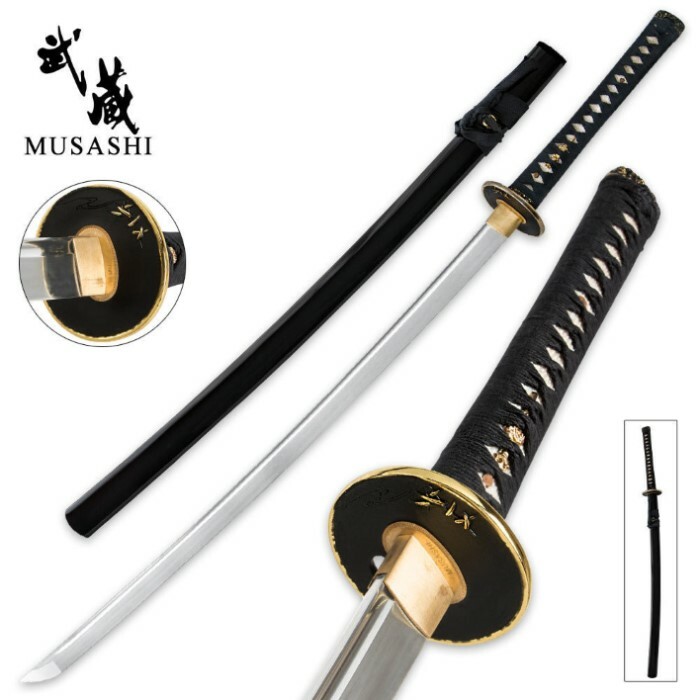 Sword feels light and easy to swing, will continue to use it in the yard for fun, other than that it will sit on a stand. I would not consider this battle ready. Blown away when I pulled the Katana out! I am a knife maker on the side so I know a little about heat treating blades. The Hamon and temper of the blade is flawless. This is my first sword but certainly not the first I have handled. For $80 bucks it is outstanding. I have cut water bottles, red oak 1" sticks, and cardboard with this so far. Not a hint of damage or scuff on the blade. out of the box it can shave arm hair no problem. The weight, fit, and finish was tight and detailed. The only thing I HATED was it was marked Masashi china which I will remove even if I have to scratch it off!! A beautiful blade, great price. After looking at several blades, here at TrueSwords, I went with this simple and really "Elegant" Blade. And it was worth it. 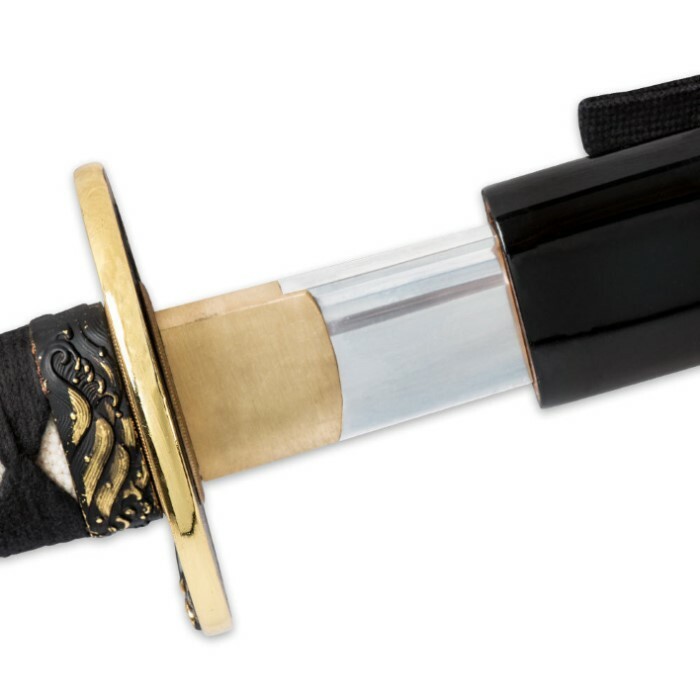 Excellent sub $100 sword for a starting collector.